The Montreal Canadiens and Philadelphia Flyers have agreed to a rather rare trade, in which each club has sent two players that have not worked out with their team to the other, with neither really trading anyone that they considered valuable. The Canadiens have announced that veteran forward Dale Weise is returning for a second stint with Montreal and will be accompanied by defenseman Christian Folin. Heading to Philadelphia is journeyman defenseman David Schlemko and minor league forward Byron Froese. Weise, 30, signed a four-year, $9.4MM contract with the Flyers as a free agent in 2016, but quickly fell out of favor in Philadelphia. After two and half seasons and a total of 34 points in 152 games, the Flyers waived Weise and, after he cleared, sent him to the AHL last month. Sportsnet’s Eric Engels reports that it was around that time that the Canadiens and Flyers began putting this trade together, as Weise was done in Philly and desperately wanted to return to Montreal. Weise previously played for the Habs for parts of three seasons from 2014 to 2016 and found his greatest success with the team, recording 59 points in 152 games. Montreal hopes he can return to that level of production, as he is signed for one more year at $2.35MM, but for now they will take advantage of his waiver status. TSN’s Frank Seravalli reports that Weise has been assigned to the AHL’s Laval Rocket. Folin though could be an asset right away for the Canadiens. The impending free agent was used sparingly in Philadelphia, skating in just 26 games for the team, but just last year played in 65 games and registered 13 points for the Los Angeles Kings. The 28-year-old is a bargain depth addition, as Sportsnet’s Chris Johnston reports that the Flyers will retain $150K of Folin’s $800K salary, bringing his cap hit down to just the $650K. The addition also gives Montreal another right-handed option on the blue line and a solid physical defender who plays well in his own zone. Karl Alzner has again been placed on waivers in an effort to bury him in the AHL to make room for Folin. As for Philadelphia’s return, they add a veteran piece not all that different from Weise. Schlemko, 31, also cleared waivers and was sent to the AHL in January. The Canadiens initially acquired Schlemko, and his four-year, $8.4MM contract, from the Vegas Golden Knights after he was selected from the San Jose Sharks in the 2017 NHL Expansion Draft. 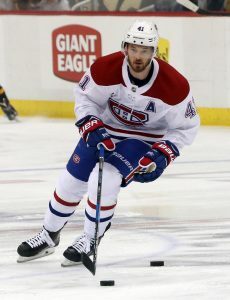 Hoping he could be a fixture on their blue line, injuries and simply poor play have instead limited Schlemko to just 55 games with the Habs over two years, as well as several minor league stints. While his cap hit next season, especially while buried in the AHL, is less of a burden for the Flyers, Schlemko is not even as much of an NHL option at this point in his career as Weise was. Case in point: NBC Sports’ John Boruk reports that youngster Phil Myers will be recalled to Philadelphia to fill Folin’s spot, while Schlemko will report to the AHL’s Lehigh Valley Phantoms. Also headed to the Phantoms is Froese, who has not played in the NHL this season. Froese is a veteran of 110 NHL games and set a career high with 11 points in 48 games with Montreal last season, but has struggled to show that he is anything more than a fourth-liner at the top level. However, Froese is enjoying a strong AHL campaign and was the captain of the Laval Rocket. Lehigh Valley could use his leadership and production down the stretch and in the postseason and perhaps Froese will even get a look in Philly at some point. The 27-year-old will be an unrestricted free agent this summer and will try to show the Flyers’ brass that he is worthy of an NHL contract. All things considered, this is a big trade in terms of the number of players and some notable names, but means very little. New Flyers GM Chuck Fletcher saved himself some cap space next season by swapping out Weise for Schlemko and strengthened his AHL roster this year by adding Froese. Canadiens GM Marc Bergevin, whose team is in the thick of the Eastern Conference playoff picture, adds some needed depth in Folin and a fan-favorite who has a chance to rebound next season in Weise. Weise is a slight risk as a salary cap burden, and neither player has extraordinary upside, but it cost Montreal nothing of value to acquire them. Could the Flyers have gotten more? Probably, but at the end of the day neither team will likely end up regretting this trade as it is. Injuries were not kind to the Canadiens last season and it certainly appears that’s going to continue in 2018-19. The team announced (Twitter link) that defenseman David Schlemko suffered a knee injury in Wednesday’s preseason game against Toronto and will miss up to six weeks. This marks the second straight year that the 31-year-old won’t make it through training camp unscathed. Last year, a hand injury sustained early in camp cost him the opening 25 games of the season which set him back considerably. He wound up playing in 37 games overall, picking up a goal and four assists while averaging 18:04 of ice time per night. The injury to Schlemko really simplifies Montreal’s remaining defensive battle at training camp. This should help pave the way for offseason acquisition Xavier Ouellet to make the opening roster while tryout Simon Despres is still in the mix as well but has to be viewed as a longshot at this point. Schlemko is the fourth Montreal regular that will be starting the season on injured reserve joining fellow blueliner Shea Weber (knee) plus wingers Andrew Shaw (knee) and Nicolas Deslauriers (facial fracture). Combined, the group makes just shy of $15MM which means the Canadiens will likely be heading into the season icing a lineup that makes less than the Lower Limit of the salary cap. The Montreal Canadiens have been in the news on a daily basis recently, given the situation surrounding captain Max Pacioretty. The 29-year old winger is heading into the final season of his current contract and apparently hasn’t been offered an extension by the Canadiens. Reports of a previous trade request have surfaced along with confirmation that the Canadiens had a deal worked out with the Los Angeles Kings at the draft, leading many to believe that there will be a split before the season begins. If there isn’t though, and Pacioretty laces up his skates at training camp and to begin the season—something he is expected to do with or without a contract extension—he’ll still be considered one of the biggest names on the trade market during the year. As the deadline next February approaches, Pacioretty’s name would be brought up again and again due to his relatively low cap hit and still capable offensive game. But there is more in Montreal than just Pacioretty when it comes to trade chips. By all accounts, the Canadiens front office is hoping—even expecting—a rebound from their disappointing 2017-18 campaign. A healthy Carey Price would go a long way to that goal, especially given Shea Weber’s ongoing struggles. Weber underwent surgery in June to repair the meniscus in his knee, and is expected to be out until December. The team got a taste of what their defensive group was capable of without Weber last season, and could struggle once again this year. If they do, and Price can’t return to his Vezina form to bail them out of it, the season could be lost once again. If the deadline approaches and Montreal is out of it, they stand ready another incredible asset. Paul Byron, who is also coming back from surgery this offseason, is another player heading into the final season of his current contract and scheduled for unrestricted free agency in the summer of 2019. The different between Byron and many of the other assets that could be on the market though is his ridiculously low cap hit. At just $1.167MM, Byron has been one of the leagues biggest bargains the last two seasons and will likely get a chance to perform once again in 2017-18. The fact that his actual salary is even lower—just $1MM this season—makes him one of the most attractive assets that could be available. To many, Byron may not seem like as notable an addition as someone like Pacioretty. But looking at the potential names available at the deadline, few can match Byron in terms of even strength goal scoring. Over the last two seasons Byron has tallied 38 goals at even strength, more than incredible talents like Phil Kessel, Jack Eichel, Leon Draisaitl, Johnny Gaudreau, Anze Kopitar, and yes, even Pacioretty. He’s done that scoring despite averaging fewer than 13 minutes of even strength time per night and playing several different positions and with different linemates. In fact, there may be a case to be made that Byron is a better asset than Pacioretty at the deadline given his versatility. Byron averaged almost two minutes of short handed time last season, and was arguably the Canadiens best penalty killer. A team looking for help during a Stanley Cup run will strongly consider the Montreal forward if made available. That’s not guaranteed though, as Montreal could still offer Byron an extension in the coming months instead. There are others too, including Tomas Plekanec, Jordie Benn and David Schlemko that could all bring back a potential return at the deadline. Schlemko is signed for two seasons, but the former two are both inked for just one year and could be worthwhile depth additions at the deadline. If the Canadiens find themselves out of the picture partway through the season, there’s no reason to hang onto their expiring assets. Luckily, they still carry enough value to allow a team that should be considering a real rebuild to cash in on their final days. It’s newsworthy times in Montreal right now, but could be again a few months down the line. The Red Wings have put a hold on contract talks with college winger David Pope, reports Helene St. James of the Detroit Free Press. The 23-year-old recently wrapped up his NCAA career with the University of Nebraska-Omaha with a 20-goal season but has informed the team that he would like to finish up his classes before discussing a contract. Pope was a fourth-round selection of Detroit (109th overall) back in 2013 and will be eligible to become an unrestricted free agent if he does not sign by August 15th. The Bruins are set to get some good news on the injury front as the team announced that winger Jake DeBrusk will return to the lineup on Saturday night after missing the last eight games with an upper-body injury. Meanwhile, blueliners Zdeno Chara (upper-body) and Charlie McAvoy (MCL sprain) have been ruled out for Saturday but could return on Sunday afternoon. With Boston looking to lock down the top spot in the East (and home ice for the first three rounds of the postseason), these returns will certainly come at a welcome time. Montreal could have blueliner David Schlemko back in their lineup tomorrow night against the Penguins after receiving the green light from doctors to return from his upper-body injury, notes Matt Cudzinowski on the Canadiens’ team website. The veteran has been out of the lineup for the past 12 games and has suited up just 34 times this season due to various injuries. If he does play, the team will either have to return blueliner Brett Lernout to Laval (AHL) or convert his emergency recall into a regular one that will count against their limit of four between the trade deadline and the end of the regular season. When the Vegas Golden Knights selected 13 veteran defenseman in the NHL Expansion Draft this past June, traded for Shea Theodore, and signed Brad Hunt, it was clear that moves would need to be made to handle their overage on the blue line. Yet, even after trading away Marc Methot, Trevor van Riemsdyk, David Schlemko, and Alexei Emelin soon after selecting them, it still left the NHL’s newest team with a log jam on the back end. The long-term injury status of Clayton Stoner also helped the cause, but by the end of October, the team was faced with no options remaining but to waive Griffin Reinhart and, more surprisingly, Jason Garrison. Both players cleared waivers and were assigned to the AHL’s Chicago Wolves, where they have remained since. However, Garrison is finally getting the chance to return to the NHL ranks. The Knights announced today that they have recalled Garrison from the Wolves. With Jonathon Merrill and Luca Sbisa both sidelined with injuries, Vegas is in need of some added depth on the blue line for the first time this season. The Expansion Draft pick from the Lightning is expected to join the team on their current road trip in Tampa and could make his return against his former team. A veteran of over 500 NHL games, Garrison was once a formidable defender, though his play has slipped as his age has climbed. Nevertheless, few would have expected the 33-year-old to have just four NHL games under his belt in 2017-18 versus 31 games logged in the AHL. While Garrison cleared waivers earlier this season, the Knights do face some risk by calling him back up to the big league squad. If Garrison stays on the roster for less than 30 days or plays in less than 10 games, he can safely be returned to the AHL. However, should Garrison exceed either of those limits, he would need to be passed through waivers again if the Knights want to demote him prior to the NHL Trade Deadline. If Garrison performs admirably in that short stint, he could prove to be a tempting option for another contender to grab on waivers. Thus, Vegas faces a situation where they either want to return Garrison to the minors as soon as possible or ensure he stays on the roster until the Trade Deadline has come and gone.